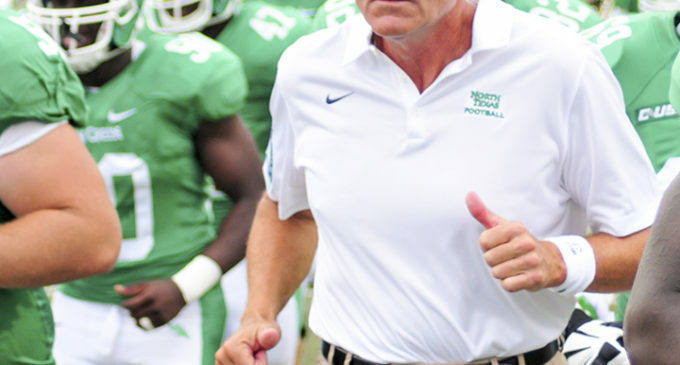 It is the norm to see Mean Green football head coach Dan McCarney full of energy on the sidelines. But McCarney has come off serious health concerns during his career. Since becoming the head coach in 2011, McCarney has suffered through health problems including a stroke, a heart bypass and diminished eyesight. Yet, the 61-year-old coach said he has never been an unhealthy person with the his lifestyle. McCarney lost 40 pounds after his playing days were over and has rigorously committed himself to a healthy lifestyle. Yet health problems began to affect him, starting with his eyesight. McCarney is blind in his right eye and constantly wears sunglasses because the eye is sensitive to light. Then, some more serious problems arose for the Mean Green coach. In 2012, McCarney suffered a stroke, but he had recovered in time to coach the team without any problems. Then, in the spring of 2013, an angiogram was done to see signs for possible blockage in the arteries. McCarney went through open heart surgery and had a quadruple bypass right before the 2013 season, in which the team won nine games and won the Heart of Dallas Bowl. The experience has made McCarney want to spread the word about heart disease and stroke. The American Heart Association felt the same way and appointed him the honorary chairman of the Denton Heart Walk, which was Sept. 13. The players find it inspirational that their head coach has come back from his health problems and kept his energy up. Senior offensive lineman Cyril Lemon was one of the players on the team when McCarney had gone through most of his health issues. Lemon said that McCarney is still working out and acts as a motivation for the players on the team. The workout players refer to is McCarney walking up and down the steps of Apogee Stadium. Sometimes even after press conferences people will see McCarney shirtless and climbing those steps, trying to get a good workout in. While McCarney brushes it off, redshirt freshman quarterback Dajon Williams said he is impressed with how committed his head coach is to exercise. Even though he is more aware of his health issues, McCarney isn’t changing too much in his life. One thing he has changed is eliminating sodas from his diet after a doctor showed him how much sugar really is in one can. Aside from that, he said he plans to stay the same.